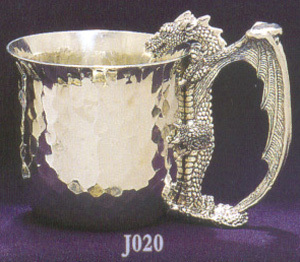 This thirsty dragon's tongue laps up your drink when this Pewter Cup is full. The flat spot at the top of his wing is the perfect spot for your thumb when you grip this Pewter Cup. It is 3 3/4 inches across at the rim, and holds 14 ounces when full. We make it by hand from lead-free pewter so it's suitable for all liquids. Your cold drink stays cold (and your hot coffee stays maybe too hot)!